A true breakfast indulgence; these Cinnamon Crumb Muffins are a moist, sweet, cinnamon filled muffin topped with a delicious layer of cinnamon crumb topping. 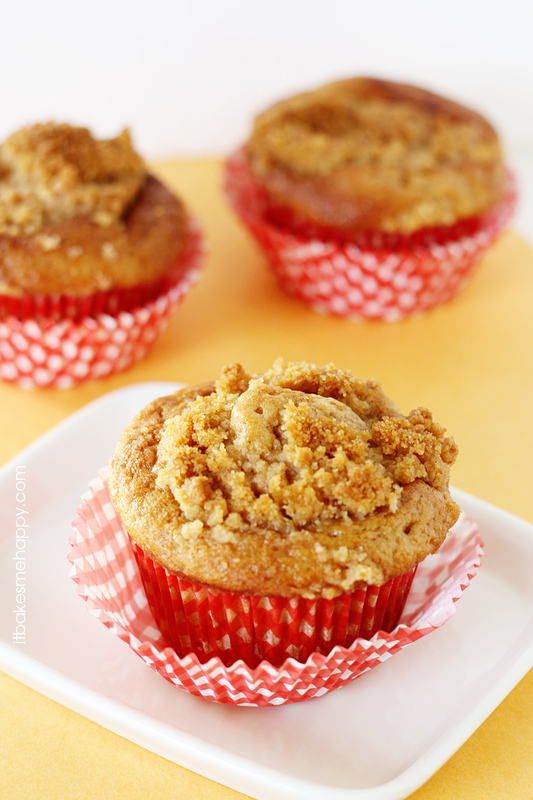 Friday was my hubby’s birthday; so in honor of him, I am sharing these Cinnamon Crumb Muffins. He is a huge fan of pretty much anything baked with cinnamon in it. You probably already know that I have a slight muffin obsession and these babies are no exception! A true breakfast indulgence; these moist, sweet, cinnamon filled muffins are topped with a delicious layer of cinnamon crumb topping. They make a delectable treat anytime of day, so go on and bake yourself up a batch to share. Enjoy and happy baking! Preheat your oven to 400º and line a 6 well muffin tin with paper liners. In a mixing bowl whisk together the egg, milk, apple sauce and vanilla. In a separate bowl combine the brown sugar, flour, baking soda, cinnamon and salt. In a small bowl combine all of the topping ingredients and mix until a sand-like texture is achived. Spoon the batter into the paper liners and top generously with the crumb topping. Bake for 15-18 minutes until a tester comes out with just a few crumbs on it. Cool in the pan 5 minutes and serve warm. I was just thinking to myself earlier today, that I wanted to make muffins this week! These sound perfect! Pinned them, Emily! Jamie you’ll have to let me know how you like them, I think I ate 3 or 4 of this batch over two days! Thank you for the recipe! They look yummy! These muffins look delicious! I just love cinnamon, too! Happy Birthday to the hubbie! 🙂 These Cinnamon Muffins look amazing, and I love that you used apple sauce in them. Definitely going to have to make these soon, we are cinnamon fans too! 🙂 Pinning and sharing! Emily, happy belated b-day to your hubby! These muffins sound and look delicious! Thanks for sharing your recipe and pinning! 🙂 Have a happy Monday and a great week! Happy Birthday to the Hubby! I bet the house smelled delicious with these in the oven. I have a slight muffin obsession as well! These look really good, Emily. Pinning and sharing on FB and Twitter. Thanks for sharing at Marvelous Mondays! PS, happy belated birthday to your husband! Thanks Shannon, I think I need to bake another batch soon! those look delicious. Anytime would be a good time for that muffin. Cinnamon Crumb Muffins are one of my faves! Came over through the GYB link up – newest follower 🙂 ps – love the blog name! These look delicious. I’m already thinking up things to make for breakfast when school starts. My kids would love these! Okay, totally pinning these. How yummy!! And healthy! My boys would love me if I made these for breakfast – thanks for sharing! The cinnamon crumb topping totally got my attention at first glance. These looks great for breakfast! My kids love these. I have never made muffins from scratch but I do a lot of cakes and cookies. When I did the crumble I added 1 extra Tbsp of butter 1/8 tsp of allspice and 3Tbsp of granulated sugar. I also substituted cinnamon apple sauce and used just one Tbsp cinnamon in the batter. These are a new morning favorite at my house and my kids usually don’t like to try anything new. Thank you for sharing your recipe. Sondra I am so glad they were a hit!